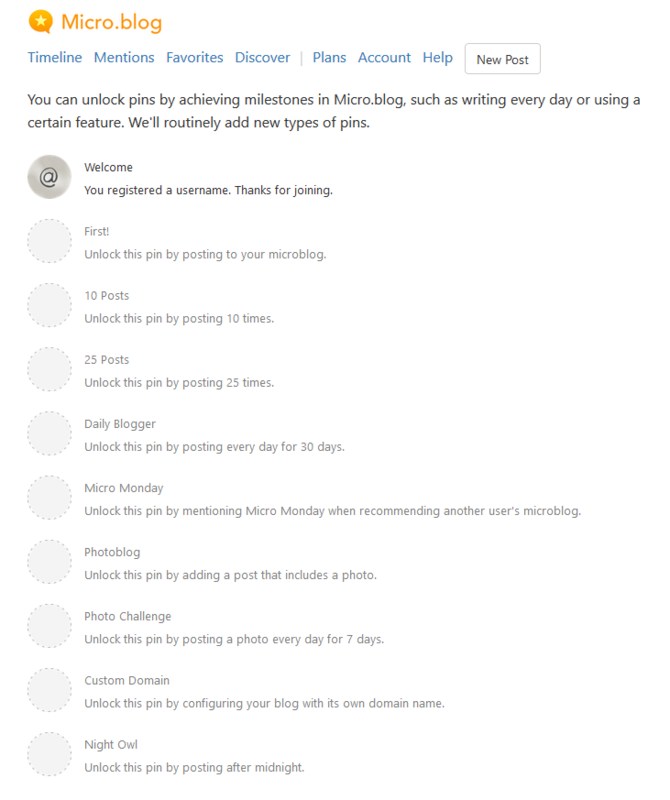 On Micro.blog you can get an idea of what’s happening across the platform by taking a look at Discover; the curated hub of posts, all of which are highlighted by a mixture of hand-picked choices and automated filters, and presented as timelines and feeds. 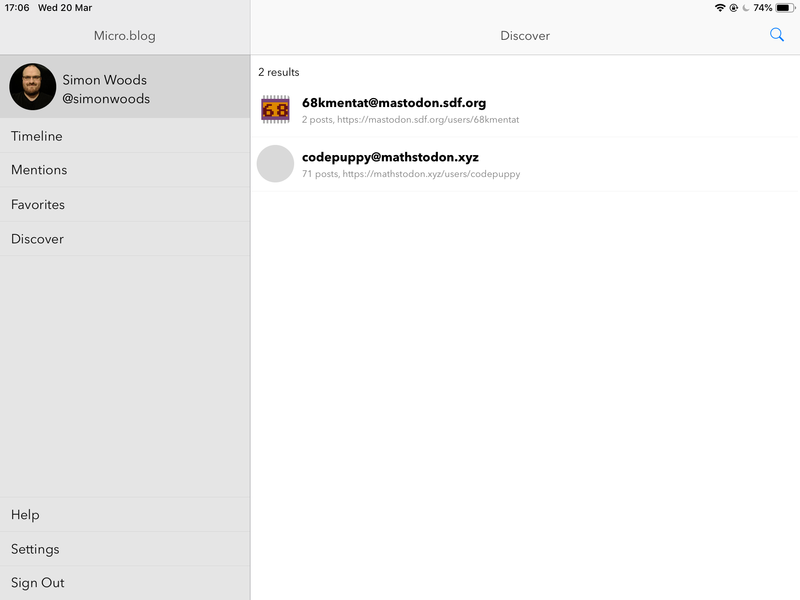 You can access the timelines on the web, in the iOS and Mac apps, and via JSON feed. 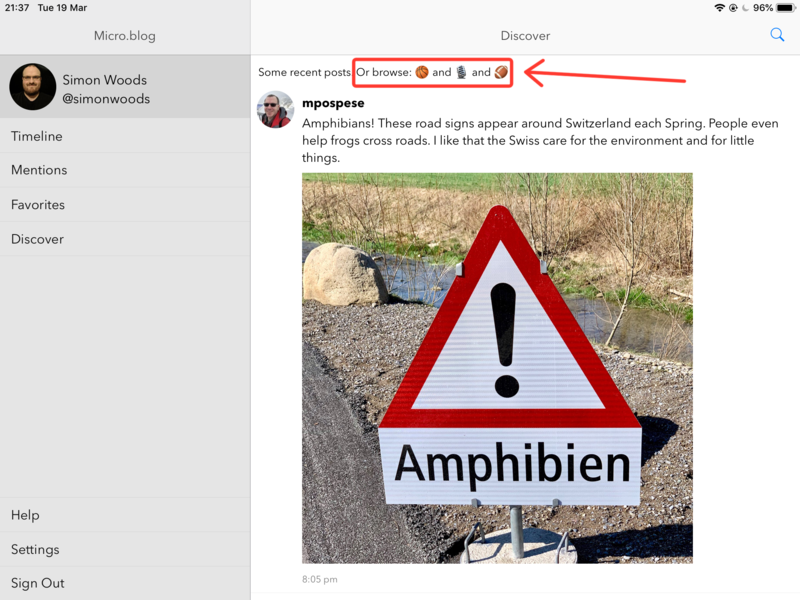 The document in Help: Emoji in Discover. This is also where you will find the special sections of Discover, separated since they are for specific events (for example: NaNoWriMo) or because they are filtered in a different way to the rest of the tagmoji. The original directory: Discover Tagmoji. 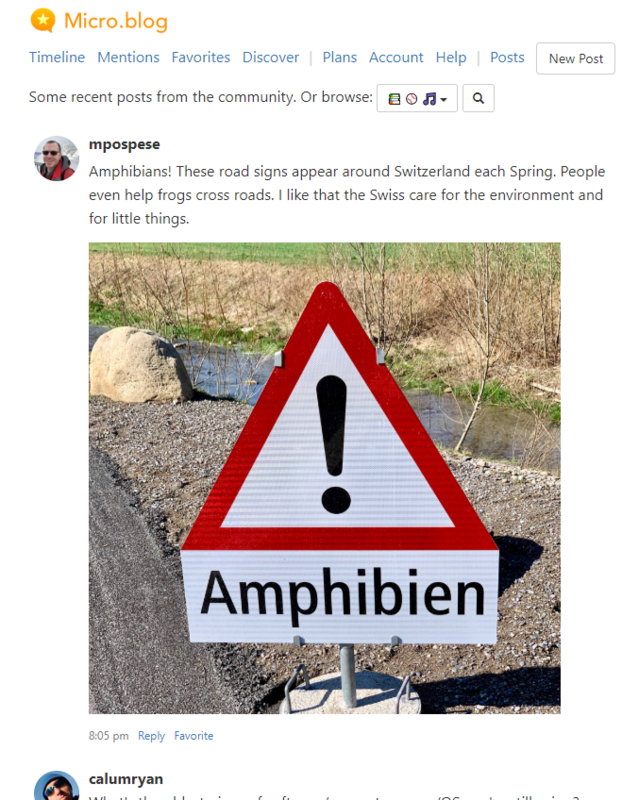 Made and maintained by Jason Burk, this page includes suggestions from the community for new filters. Discover is available to non-members and members alike, can be used in the official apps, and is available to third-party developers for their apps. 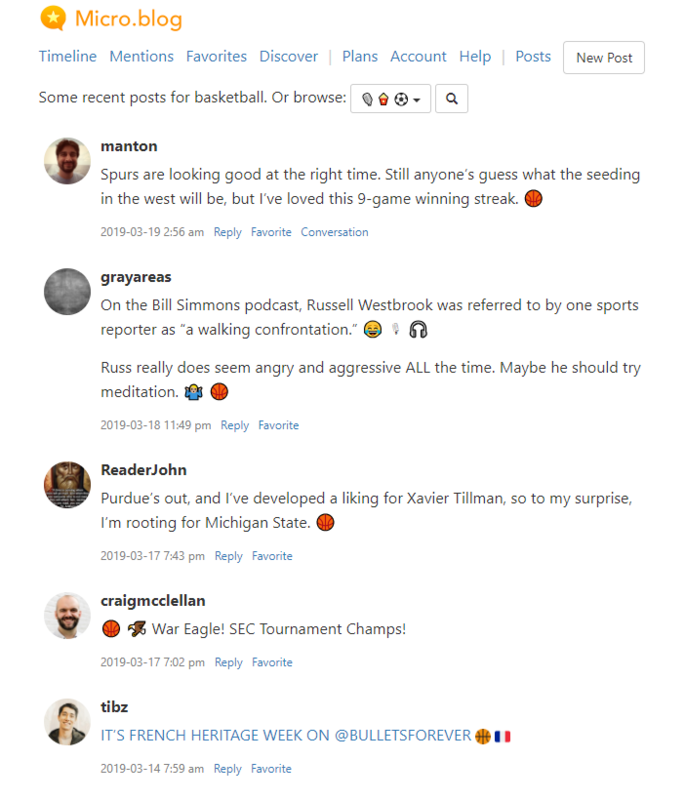 It is updated once or twice per day by Jean or Manton, and the web app currently has the most comprehensive version of this part of the platform, specifically regarding the emoji menu and full search results. This publicly available part of the platform is good for both non-members and members, providing insight into the community and further access to the people within. With Discover you can find other people with similar interests or simply get involved with one-off conversations about any number of subjects, whilst you can also catch up on news and information regarding the lives of people, the things they make and are doing. There we have it; that’s Discover. Now you know what to do and how to do it. 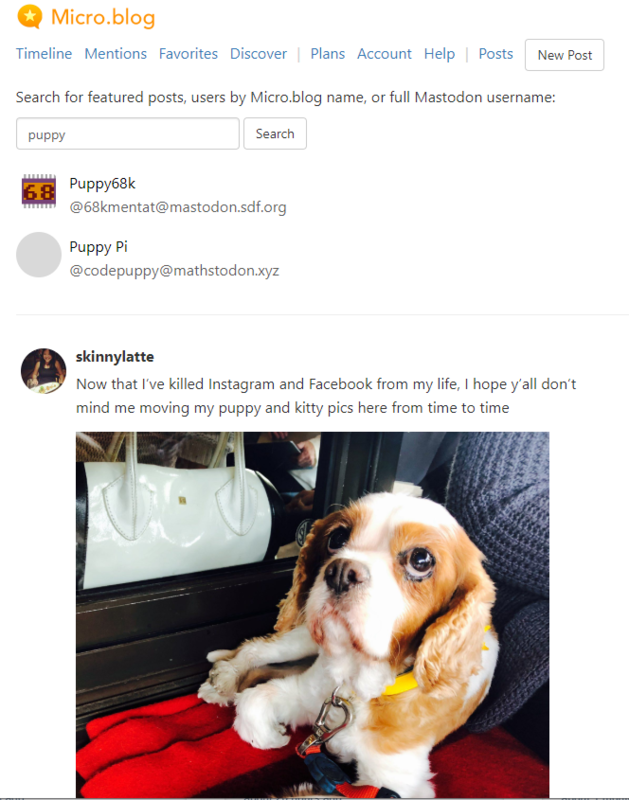 On Micro.blog you can save posts into a separate collection, made available in a special version of the timeline called Favorites. This collection is entirely private and the authors of posts you choose to favorite are not made aware of this action at all; there are no notifications of any kind when it comes to favorites. You can both take this action and access the timeline on the web and in the iOS app. Let’s save and view some Favourites. 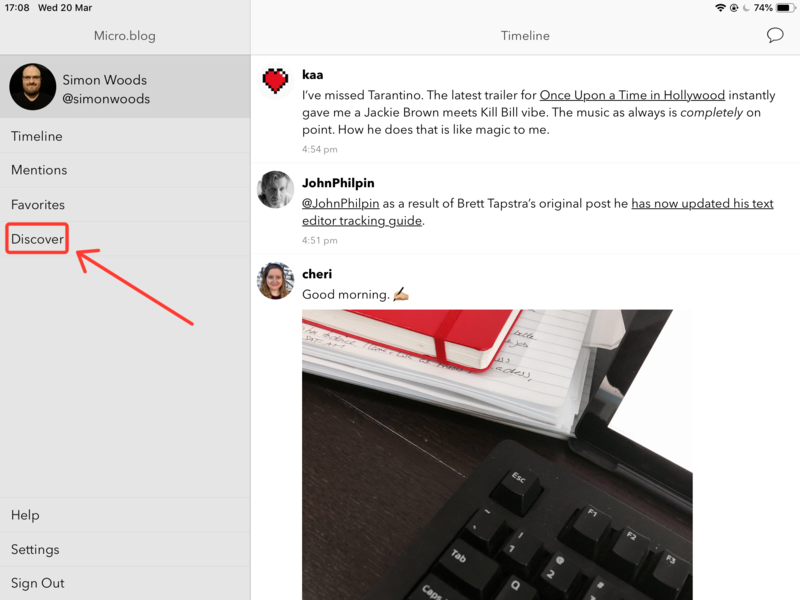 Whether on the web or in the app saving favorites means using your main timeline. Make sure you have it loaded. 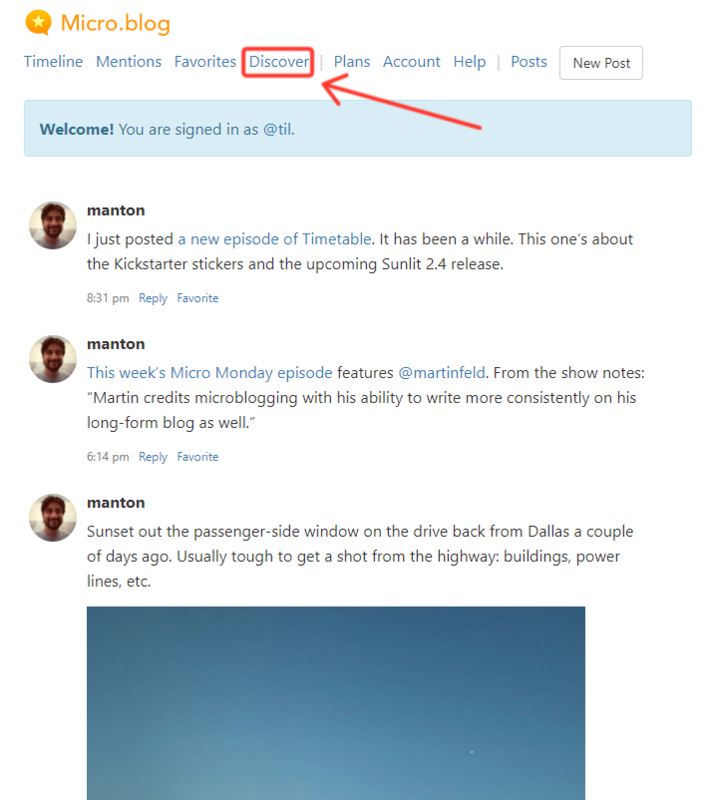 One important issue with Favorites is the availability of the feature; whilst it is available via the method displayed above, it is not as consistently available in every view, for example you can favorite replies in certain situations but not all of the time. 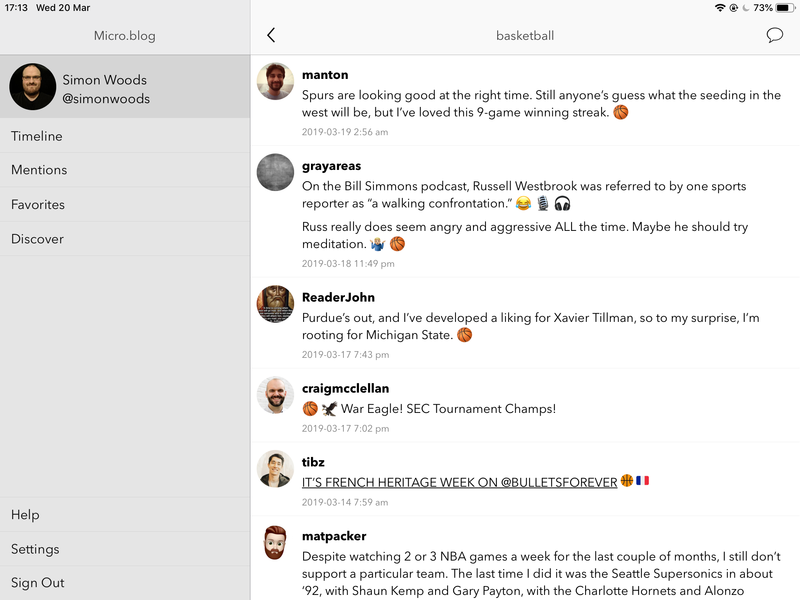 You can also use Favorites outside of the official apps, whether in dedicated third-party apps or those that use protocols built on open web standards. For example, you could use the Bookmark feature with OmniBear, Quill, or Indigenous to save anything from across the web. 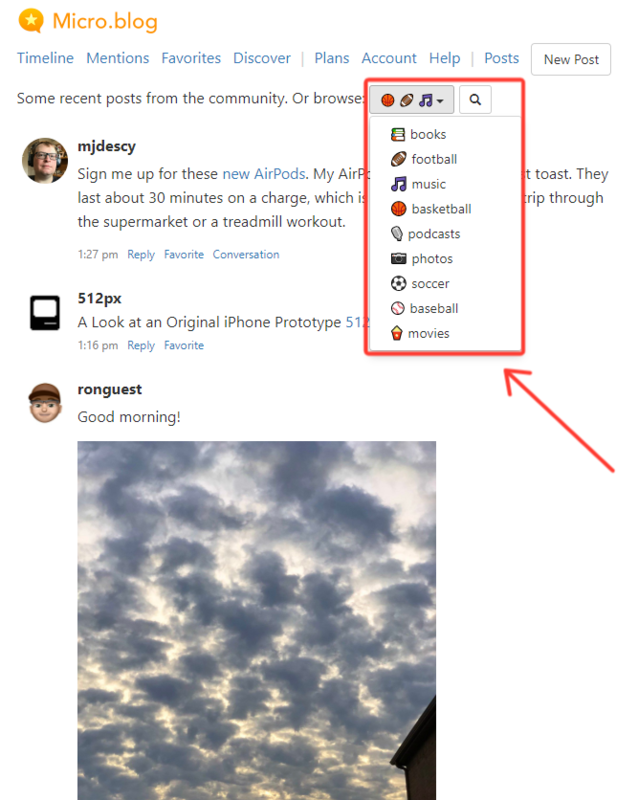 lastly, they can be used for grouping together mini-collections by favoriting the individual posts and replies one after the other. You can use them in one of these ways or a mix of them, such is the flexibility inherent to this simple feature. 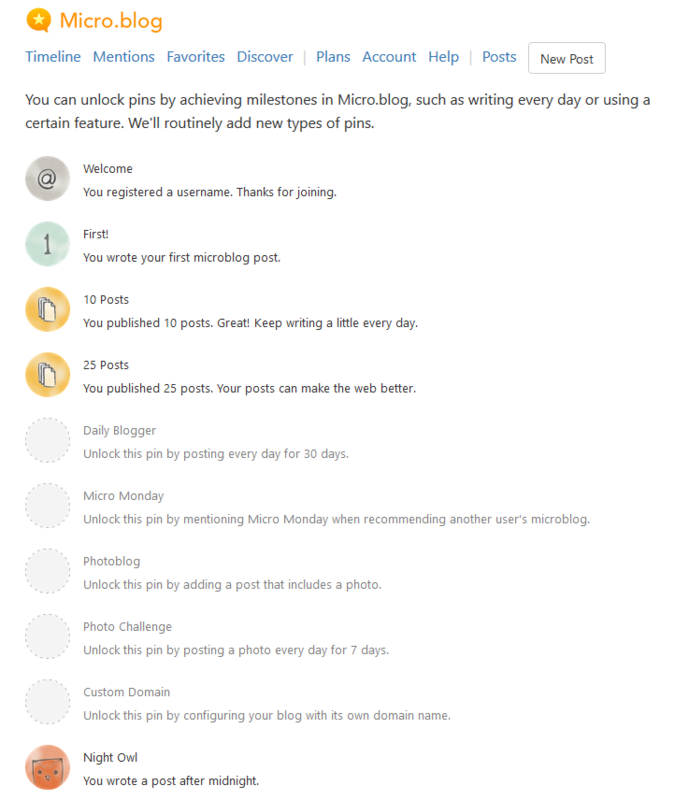 As with the rest of Micro.blog, there is no doubt Favorites will be improved over time in a stable, iterative manner; in the meantime you can ask for help and provide feedback via the official support channels. There we have it; that’s Favorites. Now you know what to do and how to do it. Let’s get our hands on the Pins. Getting a look at the regular pins means using the web. Make sure you’re logged in and ready to go. Welcome: Every account starts with this pin. It is a word of thanks for creating an account. First! : You unlock this pin the first time you post to your account. 10 Posts: Once you have published 10 posts you will receive this pin. 25 Posts: Once you have published 25 posts you will receive this pin. Daily Blogger: Once you have published at least 1 post every day for 30 days you will receive this pin. Micro Monday: The moment you partake in Micro Monday for the first time you will have also unlocked this pin. Photoblog: The first time you publish a post with a photo in it you will unlock this pin. Photo Challenge: If you publish a post with a photo every day for 7 days you will unlock this pin. Custom Domain: Should you choose to subscribe to a Hosted plan and configure your site with a custom domain this pin will appear. Night Owl: As soon as you publish a post after midnight you will unlock this pin. Pins are a fun way to both get involved with the community and motivate yourself for posting in a variety of ways, with the potential to become even better over time; who knows, perhaps we’ll have real pins, whether for general availability or meetups and the like! Over time Manton will add more pins and continue to release limited editions for events. 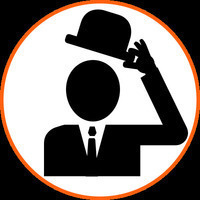 If you have any ideas for new pins or issues you can contact the team via the official channels, as they are happy to take suggestions and help. There we have it; that’s pins. Now you know what to do and how to do it.